Officials with the Mississippi State Fair say that a child was injured this past weekend after falling from a ski-lift type amusement known as the “Skyride.” According to officials, the accident happened around 11 p.m. when the seven-year-old boy fell more than 30 feet from the ride. Emergency responders say the child was taken by ambulance to the University Medical Center where he has a compound fracture. Officials with the fair say that the incident is unprecedented and that the Skyride, long a fixture of the state fair, has never been involved in any other accidents. Officials with the fair say the ride was closed immediately after the fall and has since been inspected by safety experts. The ride is now open after all equipment appeared to be in proper working order. Though everyone understands that some amount of danger is associated with amusement park rides, many would likely be surprised to learn just how many people are injured every year on such rides. According to the Consumer Product Safety Commission, nearly 7,000 people seek emergency room treatment for amusement park injuries, meaning thousands of people are leaving amusement parks with more than a simple thrill. A study conducted by the Consumer Products Safety Commission found that nearly 21 percent of those injuries took place on merry-go-rounds or carousels, while just over 10 percent of injuries resulted from roller coasters. Somewhat surprisingly, another four percent of injuries were caused by bumper cars. According to the CPSC, the most common cause of minor injuries is falling, especially among children age five and younger. More serious and debilitating injuries and deaths are commonly caused by mechanical failures, operator errors, rider behavior and design defects in the machines themselves. 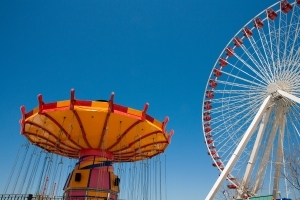 Despite the fun offered by state fairs and amusement parks, the fact is both are commercial enterprises and, as such, must follow strict safety regulations. The law in most states, including here in Mississippi, holds amusement park operators to a high standard of care when it comes to personal injuries to visitors. If you have been injured and think you may have a personal injury claim, please contact the Madison / Jackson personal injury attorneys at Kobs & Philley at (601) 856-7800. Source: “Boy plunges 30 feet from chair-lift ride at Mississippi State Fair,” by Ted Malave, published at KFOR.com.